Fifteen-year-old Bridget Liu just wants to be left alone: by her overprotective mom, by Matt Quinn, the cute son of a local police sergeant, and by the eerie voices she can suddenly and inexplicably hear. Unfortunately for Bridget, the voices are demons – and Bridget possesses the rare ability to banish them back to whatever hell they came from. Literally. Terrified to tell her friends or family about this new power, Bridget confides in San Francisco’s senior exorcist, Monsignor Renault. The monsignor enlists her help in increasingly dangerous cases of demonic possession, but just as she is starting to come to terms with her freakish new role, Bridget receives a startling message from one of the demons. And when one of her oldest friends is killed, Bridget realizes she’s in deeper than she ever thought possible. Now she must unlock the secret to the demons’ plan before someone else close to her winds up dead – or worse, the human vessel for a demon king. I read two of Gretchen’s other books (Ten and 3:59) and I really enjoyed both. I had Possess on my shelf for a really long time and I finally for around to it. I didn’t like it as much as Ten or 3:59 but it was still pretty good. I didn’t feel like Possess was really original, it was just normal demons and exorcist stuff, and the characters were not bad. I didn’t really like them but I didn’t hate them either. Something that did bug me was how Bridget was half Chinese but it was completely ignored the whole book. I love diversity in YA and I think there needs to be more but it also needs to be done right. Bridget was written to be half Chinese but she had none of the traits. The author keep talking about her blue eyes and extremely curly hair. About her being half Irish. It was a little frustrating to me. 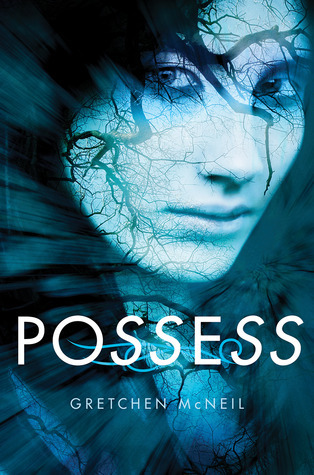 Overall, Possess was an okay book. I didn’t hate it but I didn’t love it either. I wish I could change somethings about it and I wasn’t really scared by this book like a lot of other people have said. I’m glad I read it but I doubt I’ll be rereading.